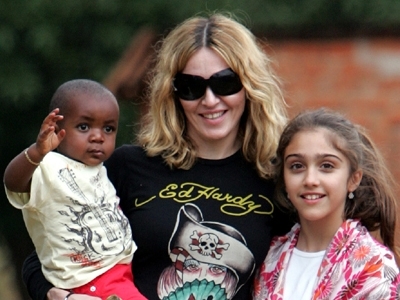 Madonna reportedly will get her way, according to The Sun, which claims the Material Mom has persuaded three appeal judges to allow her to adopt Malawian orphan Mercy James. Madonna, 50, whose application for the three-year-old was rejected in March, will get her new ruling next Sunday at Malawi's Supreme Court of Appeal. "All recommendations are in favour of the adoption taking place," a source reveals. "Mercy should start packing her bags. She's off to America." We confess: when Lourdes Maria Ciccone Leon was born we thought, "What an unfortunate child to have to grow up in Madonna's spotlight with that uni-brow!" But after images of Lourdes alongside her tight-faced cougar mom in Malawi surfaced, we forgot about Madge's failed attempt to get little David Banda an orphan sis, and all we could think was, "My how Lourdes has grown!" The blossoming 12-year-old (whose father is mom's former personal trainer Carlos Leon) looked like a ga ga gorgeous gazelle, and in honor of her beauty, we're listing our fave fashion pics of Madonna's stunning, formerly quirky (remember her dorky horn-rimmed glasses? ), fashion tween queen. Mark our words, she's gonna be a star! Matching Knit Caps “She doesn’t need my guidance when it comes to fashion," Madonna said of her daughter's “sort of goth punk" style. 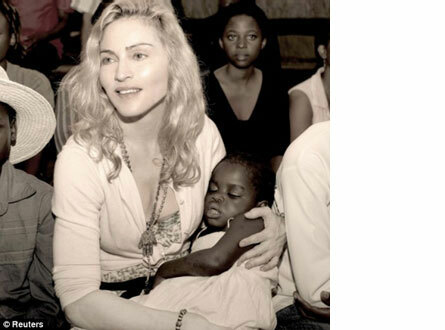 "She doesn’t listen to me.” In Malawi in 2007 "I can get my older daughter to babysit for me," Madonna said of big sis watching little David on the Today show. "Both kids are really great with him." Gucci for a Cause with Mom Lola was front and center at Madonna and Gucci's UNICEF fundraiser for the kids of Malawi in February 2008, even meeting Alicia Keys and Vince Vaughn. Madonna said she "tends to walk into a room and demand that everyone pay attention to" her! The Leons in Leather "She's into shopping, fashion, anything girly," Leon told PEOPLE of his little Lola. "She's my princess. I spoil her with love—and American Apparel and Urban Outfitters." Lourdes Mania in Malawi Granted Madonna came for another Malawi baby, but it was a leggy Lola (who will soon outgrow mom) who got the Today show talking--they even dedicated a segment to her: "Lourdes has grown up!" anchor Matt Lauer said.